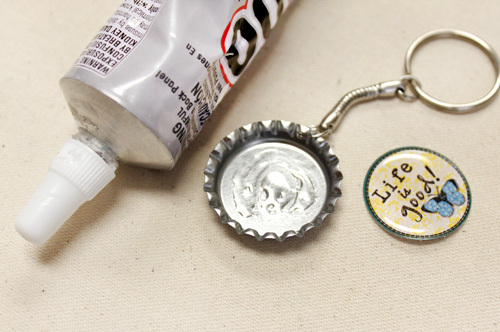 Here's a simple DIY for making bottle cap key chains. Ours says "Life is Good" but yours can say whatever you like. 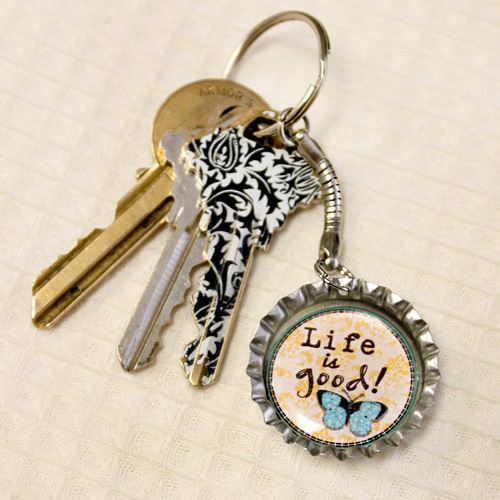 Promote your cause, support your favorite team or just give some flair to your key chain! Add any design you'd like to that 1 inch diameter space. It's just waiting for you to fill it! Option #2 Create your own pendant. *Shown in the steps below. Punch a hole in the edge of your cap. Position the tool between the grooves on the skirt of the cap and lightly squeeze. Voila! 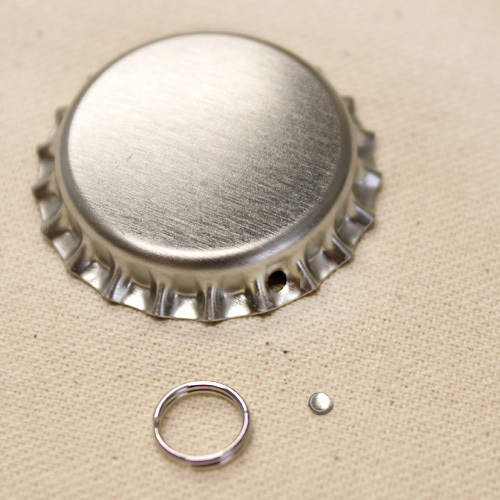 You have a beautiful, nice clean 1/16" hole in your bottle cap. Option #2 is to use the Split Ring Tool. It's pretty simple, it saves your fingernails and you can get really fast at it. There's a quick tutorial here if you'd like to see how to use a Split Ring Tool. 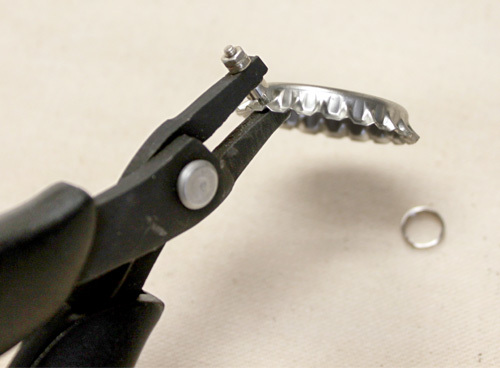 Once you've added the Split Ring to your cap, feed the small end of the Key Chain through the ring as shown below. Now the key chain is all prepped to add your design! This could be three steps but they're so quick and simple that I'll combine them into one step with three pictures. I like pictures! 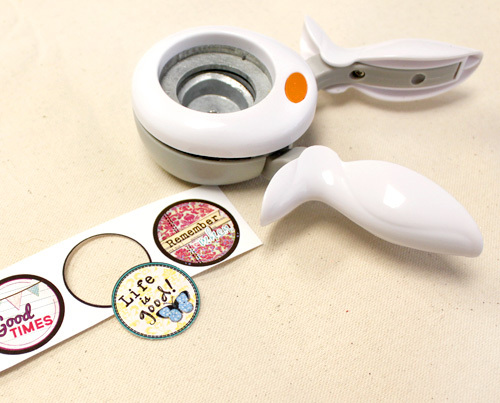 Use a 1" Circle punch or cut with scissors. 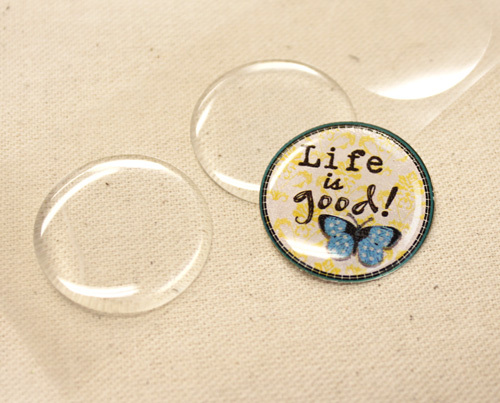 Adhere the Epoxy Dot sticker to the bottle cap image. Be careful not to touch the sticky side of the dot. 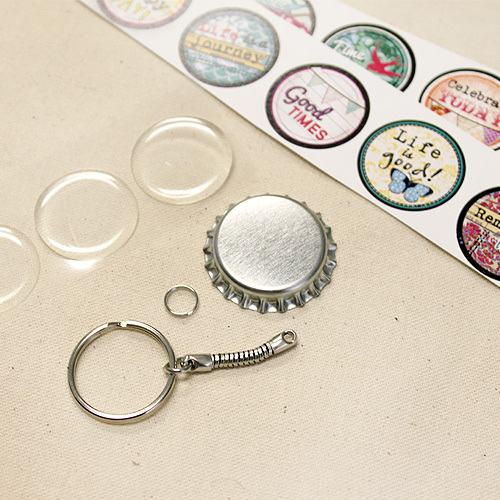 Glue the Bottle Cap Image into the Cap. Make sure to let the glue dry for about 10 mins. If you are using E6000 just a very thin coat will work perfectly. It works best if you don't put glue all the way to the edges of the bottle cap because if it squishes out around the top of the Epoxy Dot, it can react with the Epoxy and do weird things to the image sometimes. What kind of paper you use to print the image on? We recommend, Glossy Photo Paper. 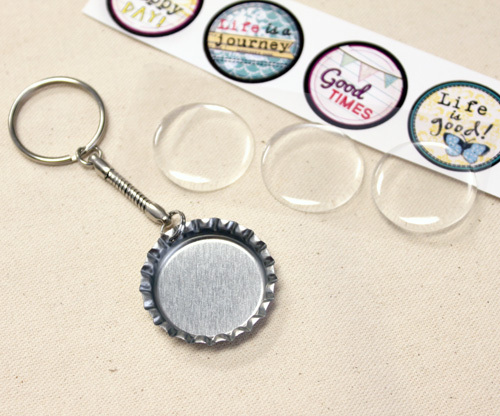 Hello, just wondering when the bottle cap key chain kits will be available again to purchase? Thanks for informing us - we updated our inventory just now, back in stock! hey, what could i use in substitute for the epoxy dot sticker? Hello! we offer a 3d Crystal Lacquer that dries clear and give a great finish.